Need to move into your new home in a month or two? This former show home is available for IMMEDIATE POSSESSION! The bungalow-style home at 18 Red Sky Road has almost 1,500 square feet, and all the space you need to live your best life. It’s a great home for those who are retiring and those who are just starting out. Oh...and did we mention it's a former show home?! Check out everything 18 Red Sky has to offer and see the beautiful community of Sage Creek for yourself. At the front, you’ll immediately see how striking the home looks on the outside. With stone details and contrasting colours, it has that contemporary look so many people like. You're also sure to enjoy the completed landscaping (with sod) and the large covered concrete front porch adds more living/entertaining space. Guests enter into a tidy foyer with a closet for their jackets. There’s a wall here that blocks the stairs into the basement, and this is the perfect spot for some eye-catching artwork or perhaps a rustic sign that has a message you find inspiring. Most likely, you and the rest of your family will enter through the door in the garage. This leads you into a mudroom with an organized closet. There’s also hook-ups for your washer and dryer in this room. Having this on the main living floor makes it easier to get the laundry done and a huge added bonus to many! 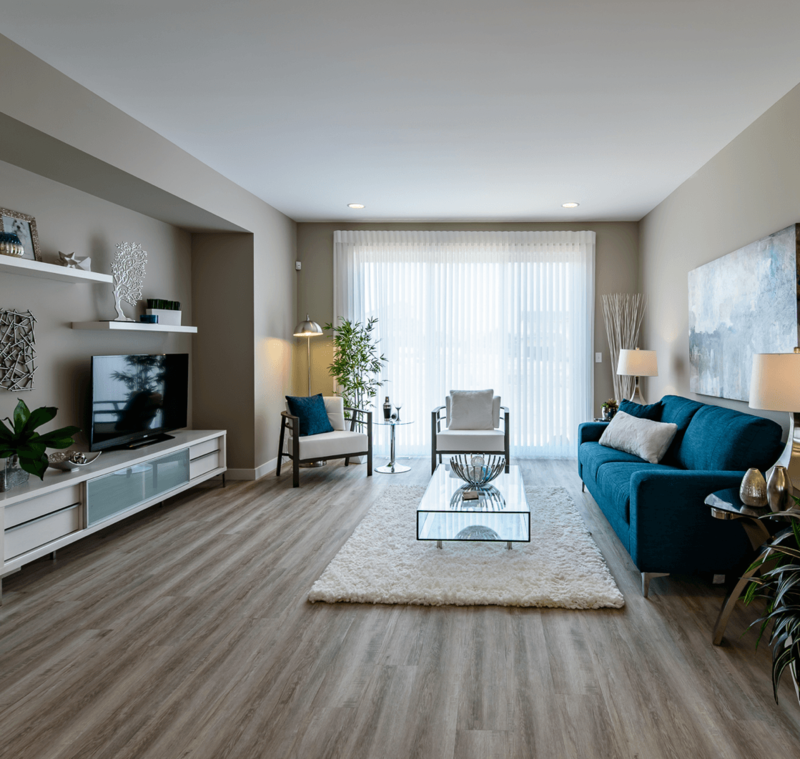 Modern vinyl plank flooring transitions seamlessly through the main floor living areas in this home and 3" casings and 4" baseboards as well as flat painted ceilings add the subtle touch of elegance homeowners are looking for. There’s also plenty of space for living and entertaining in this home - all made possible by the open floor plan. In the kitchen, you’ll enjoy the quartz countertop and eating lip on the island at the centre. 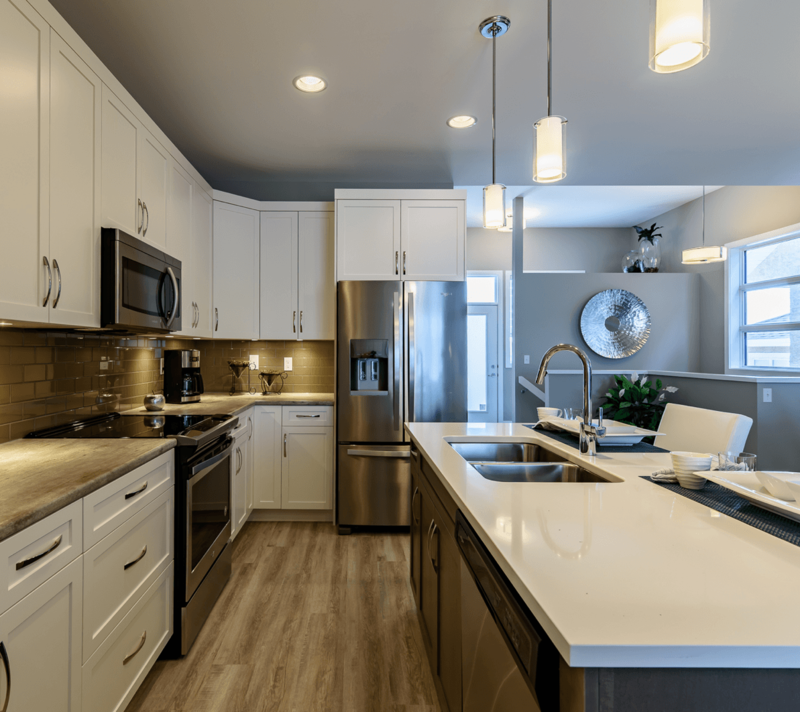 The hanging pendant lights over the island really give it a classy feel, and the under-cabinet lighting throughout the space gives the room a nice glow in the evenings when you’re not using the kitchen. 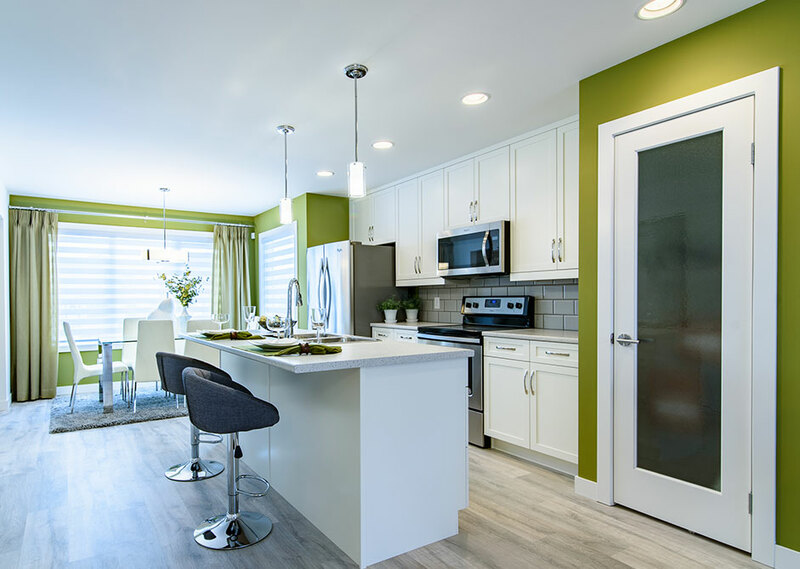 With the dining area right next to the kitchen, it’s easy to put family meals on the table, but this also creates a very open space for your next party. Guests can easily stand around the island and kitchen table while they nosh on your yummy treats. The great room has a comfortable feel, and you can just picture yourself sitting in here watching a movie or cozying up with a good book. The cantilever that juts out gives you some extra space to put something like a large entertainment centre without feeling like you’re cutting into the rest of the room. With large windows and a 9' triple panel patio door to the deck in the backyard, there will be a lot of natural light filtering into the space. Both the kitchen and the great room are overseen with potlights throughout. This design includes everything you’ve been looking for in a master suite: a large bedroom area, walk-in closet, and ensuite. Your ensuite is especially nice, with a 5' acrylic shower. The floor plan includes two secondary bedrooms you can use for the kids or as a guest room. The bathroom between them is just as nice as the one in your ensuite, but you’ll be happy you don’t have to share. If you don’t need all of those bedrooms, you can easily turn one of them into a home office, den, or craft room. The choice is yours. If you want a bit more space, you can get it by choosing to develop the basement. We’ve already chosen to build the basement using steel beams so there’s a large, open space down there. If finished, this will become a big rec room -- perfect for throwing parties. It might also be the sports room where people come over to watch the game. A finished basement will also include a bedroom and a full bathroom. Altogether, this would add over 1,000 square feet to the living space, and when the cost is built into the mortgage, it’s much more affordable than you might think. Sage Creek is in Southeast Winnipeg, and it’s an absolutely lovely neighbourhood. There are walking trails meandering through wetlands and areas of native growth. You’ll be excited to get out each and every day for your walk because it’s so fun to watch the scenery change over the seasons. At the same time, Sage Creek is close to the perimeter, so you can easily head out of the city with minimal traffic. There are also a number of stores and restaurants nearby for you to get your weekly shopping done. This great home has a price tag of just $459,925 for IMMEDIATE possession, so we know it won’t last long. Talk to a Broadview Homes sales agent about making this your next home - we'd love to tell you more! Originally posted October 11, 2018, updated January 24, 2019.